The Management Console is the feature of Automation Server you use to administer Production or Test environments and perform maintenance activities such as following up Scheduled jobs, changing the SMTP Server for notifications, setting execution traces, reviewing connection parameters configured for integrations with external systems, and managing licenses and clustering in your Production environment, amongst others). 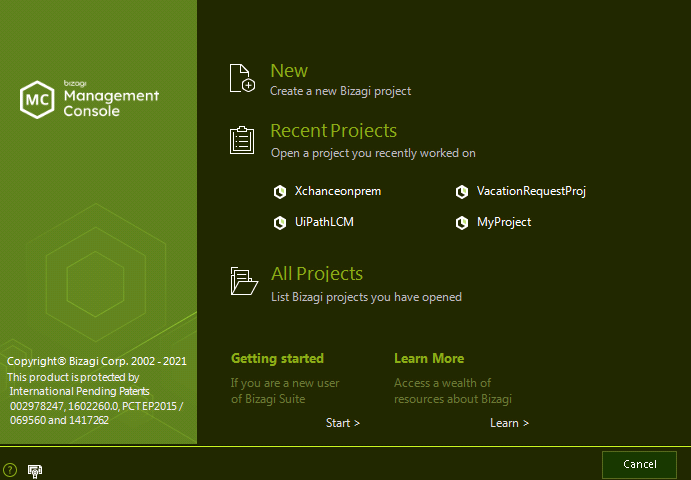 The Management Console is installed with Automation Server so you can manage projects in Production environments, but, is also installed with Bizagi Studio so you can manage projects in Development and Test environments. When you open the Management Console, the splash screen offers shortcuts for common options. •Access our documentation and guides to get started with Bizagi. •Install free process templates from our Process Xchange. •Administer your Production environment licenses. Some of these options are also available in Bizagi Studio. Once you open your Production or Test environment project, you can review or administer the environment's configuration. Manage your registered projects (upgrade them, disjoin to them, etc). For more information refer to Registered projects. Launch the package visualizer to explore objects included on the .bex file. For more details refer to Package Visualizer. Offers quick-access options presented according to the Module selected. See the menu options sections below for description of the specific options in your project's implementation. Shows the current options which you can edit for this environment. For more information, refer to Environment Configuration. Turn on the different trace files for Bizagi's execution. For more information, refer to Error control and diagnostics. Delete all existing cases in the current environment (for Development or Test only). Change the Admon user password. If the password is not explicitly specified, the Admon user password will be left blank. Browse our official documentation or download it as a PDF. Directs you to our free Process Xchange where you can browse and install our available process templates. Share information about Bizagi with your friends. Directs you to the official documentation Release Notes of you Bizagi version. Manage your Production environment licenses. For more information, refer to Licenses. 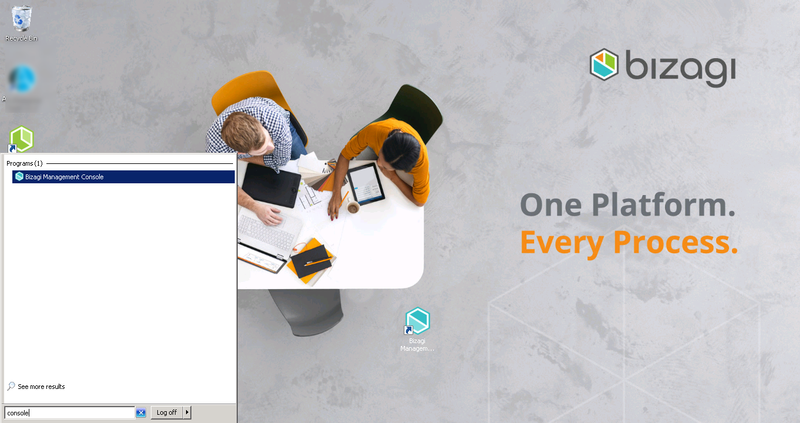 Options in modules lets you manage: The Scheduler and its jobs, external systems, security settings, organizational user group definitions and a clustered environment. The Scheduler is a service created in each Bizagi project, to carry out jobs such as: sending alarms, triggering timers (activating timed delays), executing replication, and running custom jobs and Asynchronous Activities. This module presents options to review or reconfigure settings in external systems integrated to the solution. Such external systems include data providers for replication and virtualization, interfaces for Web or REST services invocations, and ECM repositories. For more information about these options, refer to External systems administration. 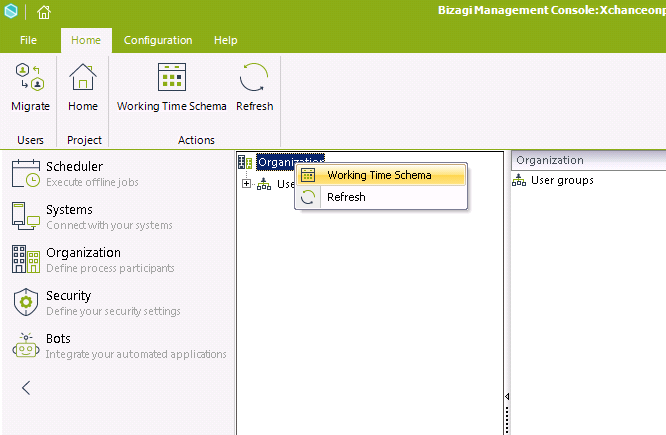 This module presents options for managing the Working Time Schema and User groups, defined in Bizagi Studio during development. •Working Time Schema: to access this option right-click the Organization icon and select Working Time Schema. A wizard displays where you can manage schedules. 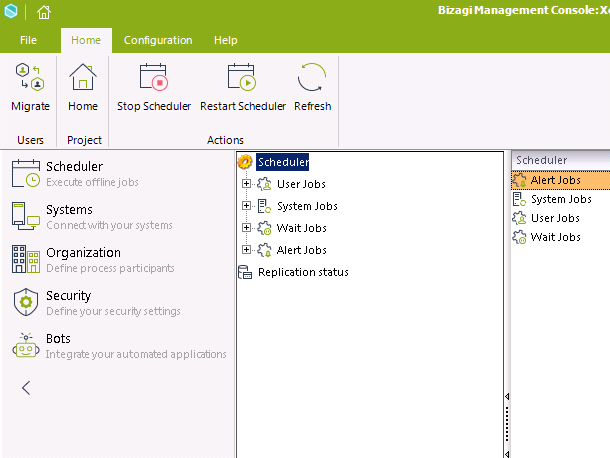 You can edit other Organization features in the Bizagi Studio and then deployed changes to production. •User groups: Use the Management Console to include users in or exclude them from groups, by clicking the Properties option at the top. If new user groups are needed, or existing ones need to be changed, manage them in the Bizagi Studio and then deploy them. Changes in this module in the Production environment will not be persisted in the Development environment. We recommend that you perform changes in both environments to keep them synchronized. This module presents options to manage the Authentication, Authorization and LDAP configurations. In a first deployment, the configuration of these options will be taken to Production. After that, they will be in read-only mode in the Development environment. Perform authentication and LDAP configuration changes separately for each environment after the first deployment. Perform required changes for Authorization options in the Development environment and then deploy them to Production. This module is presented only in a Production environment. It lets you manage nodes configuration for a clustered-Production environment, or move your current Production server. For more information, refer to Server Management.